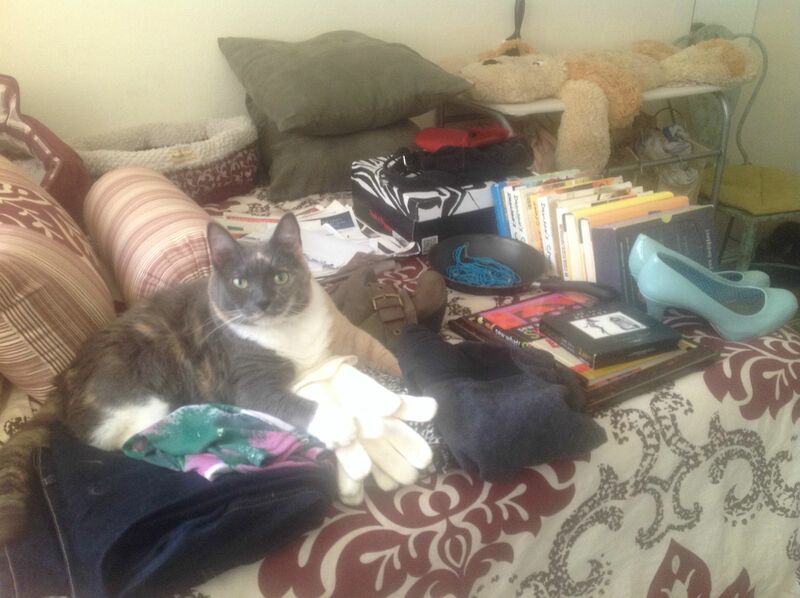 "Tomorrow, I'm going to declutter 30 things." Okay, the resolutions theme of my blog might get a little confusing this month because tomorrow I'm actually decluttering 29 things. Today, I decluttered 30 things. The theme has always been a little tongue-in-cheek because I, and my co-blogger at the time, Rachael, knew we'd only be writing about resolutions we'd already met--the recipe we already tried, the book we just finished, the playlist we just listened to. The amazing thing is, the more I write about my accomplishments in the blogger voice-- authoritative, casual, instructional-- the more comfortable I get looking forward. Really, if a goal is simple, the deadline soon, (not a year from now), and the actions are meaningful to me, there's a good chance it's going to happen. So when I saw that So Damn Domestic had a 30-day clutter-free challenge, I said, "I'm in!" I have a smallish apartment and have moved twice in two years, so I'm not sure I'll be able to keep up with the moms with 4-bedroom homes and garages full of stuff. But Emily of So Damn Domestic implied that we're allowed to count individual discs, separate shoes, pieces of paper. We could count thumb tacks separately if we wanted to, so I'm confident I can make this happen. I'll probably start counting pieces of things later this week, but to get started, I'm making the big gesture. A DVD box set that could count as five things if I took out all the discs, today, it's one thing. 1. 50's Decade CD set. I listened to it with Momo on our last road trip and we were both like, "Eh, I could make better." No offense, Retro Music (C). It's a personal call. 2. Book: "sew what! Skirts" My friend, Katie, gave this to me when I helped her declutter years ago. Guess how many skirts I've made since then. 3. Way too '90s picture frame. I tried to give it back to my mom but she only heard my complaint about no nail hole and created one out of duct tape. Solid effort, Mom, but it's still ugly. 4. Skillet left behind by a past roommate. I have another one the same size that heats more evenly. 5. Necklace I never wear. 6. Ankle boots my feet got too fat for. They were well-loved. 7. Heels I bought for a Maud Pie cosplay, but I realized they were too painful to even walk across the apartment in, so I never wore them out. 8. Toddler jacket left behind after babysitting. I'll see what his mom wants me to do with that. I know he's outgrown it. Whoops. Will have to clean the cat hair off of everything, of course. Doesn't it kind of look like she has giant Mickey Mouse paws? 9. Dress that's too small in the bust. 10. Gloves. I live in sunny Los Angeles now. I barely wore these when I lived in chilly Bellingham. 11. Blouse that's too small in the arms. 12. Jeans that fit weird. 13-16. Books: Sisterhood of the Traveling Pants set. I held on to these because I love them as a preteen and they were a gift from Momo, but I'm not a preteen anymore, and if I get an urge to read them, the library will have copies. 17-23. DVD season box sets. They take up so much space and I can find all of these shows on streaming services. 24. Boots I bought online that claimed to be wide-calf but I'm beginning to think wide-calf is a lie. 25, 26. Purses. I stopped using purses. I carry a wristlet. FREEDOM. 27. Stack of paper. This one's kind of embarrassing. I have a huge box of unsorted papers. I had a bad habit of picking out the important mail and throwing the rest in a box. I'll be going through that all month probably. 28, 29. Gray pillows that came with my couch. I replaced them with bright colored, patterned pillows, of course. 30. Aveda lotion bottle. Writing this list, I realized I only had 29 things on the bed. I just added that one. It only has a tiny bit of lotion left so I'll finish that tonight and recycle the bottle. That wasn't so hard! I'm excited to see how much I can accomplish in a month. I'm going to look into how to sell as much as I can, and donate or toss the rest. By next month, it'll be easier to tidy my apartment. Next time I move, (whenever that is), it'll be easier to pack and unpack. There's tons of reasons to let go of things. I look forward to exploring all of them!